Language sciences : are they for real or are they fake ? Language sciences: are they for real or are they fake? Around four billion six hundred million years ago, gravitation and a cloud of gas gave birth to the Sun. 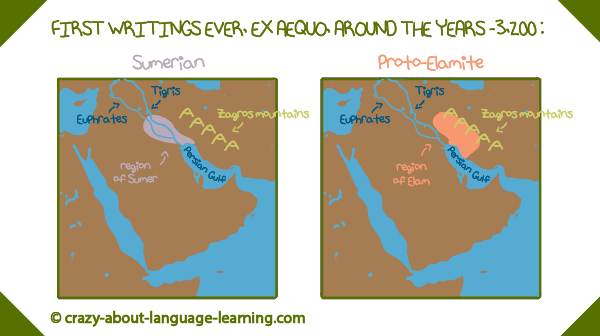 A few million years later, Earth came to be too. We know that. Scientists have studied the evidence (that is, terrestrial, lunar and meteorite rock samples) and thanks to their knowledge (that is mostly in this case, their knowledge of radioactivity and its correlated radiometric datation techniques), they’ve been able to tell us the age of our planet and solar system. Language, our ability to speak, write, communicate, has also been under the scrutiny of scientists. Specialists of language sciences have in fact found evidence in this domain too (mainly in our brains, old writings and languages themselves) and they’ve applied their scientific knowledge to explain it to us. 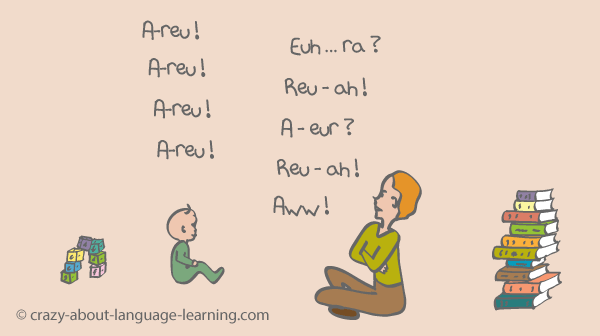 – Our language skills are generally administered in the left hemisphere of our brains. Scientists have used Magnetic Resonance Imaging* (MRI) and observation of language-impaired people to know about that. – We need a certain amount of encephalization, that is of brain mass relative to body mass. As an example, an average tyrannosaurus weighed seven tons all included while its brain only weighed two hundred grams. In comparison, for a body mass that is much less than seven tons, a humans’ brain weigh 1,300 grams on average. Much better. 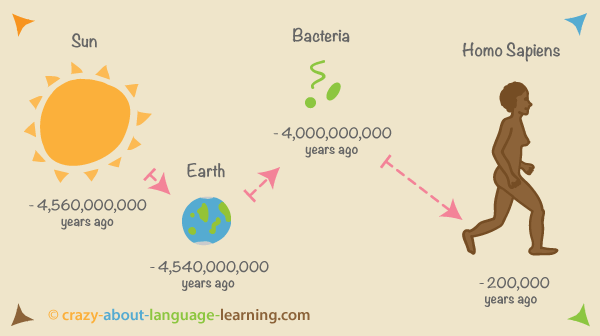 – The other prerequisites of language are the following : good health of a few language-related genes, a nice larynx, a tongue, a need to communicate elaborately (that other species, even chimpanzees, seem to lack). – Languages have common ancestors, they can be put in family categories. Linguists have found that by studying the languages themselves, by comparing them and finding ressemblances between them. – The exact time when we started speaking. Enigma : when did we start speaking ? The difficulty resides in the lack of archeological proofs. Some scientists base their estimate on the size of brains. They think Homo erectus already had the necessary brain size to be able to speak 500,000 years ago. Some others think that Homo sapiens were the first to speak when their brains achieved very near to our brains’ present size 150,000 years ago. 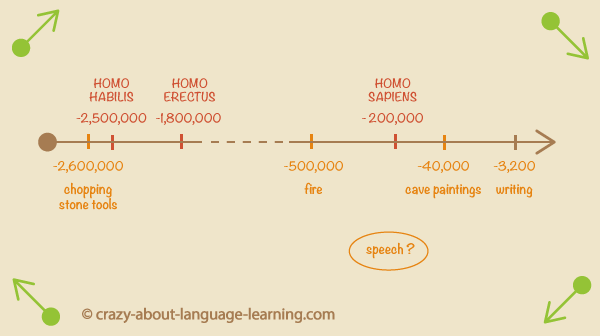 Some more argue that language conveying abstract concepts, we must have started speaking only at about the same time we started painting art on cave walls around 40,000 years ago. – Is grammar already encoded in our brains at birth or is it learned from then on ? Noam Chomsky devised the theory of Universal Grammar, that is of grammar rules encoded in our brains. He thinks that nature largely wins over nature on this question, but his theory nevertheless remains an unproven and debated theory. – How did we come to speak and why ? Linguists’ opinions are not yet (if they will ever be) conclusive on this subject. While Noam Chomsky for example thinks genetic mutations did the trick, Derek Bickerton nuances this by giving an evolutionary perspective to it. According to Bickerton’s theory, humans started to speak because, besides having the capacities, they also had a special need : the need to persuade others to help scavange dead animals. What is quite nice about scientists not yet being able to decide who is right or wrong is we can all come up with our opinion in the meantime. So, what do you think about this theory of Bickerton ? Also, have I convinced you that language sciences are for real ? Tell me about it in the comments below ! * Magnetic Resonance Imaging (MRI) shows changes in blood flow and thus in cerebral activity.